After an absence of almost twenty years, Verdi’s Nabucco is back at the Lyric Opera of Chicago, with a cast that makes this powerful score resonate incisively. Carlo Rizzi’s insightful conducting set the tone from the start, with a keenly shaped overture. He articulated the instrumental quotations of the opera’s vocal music with remarkable distinction. The prominent brass sonorities were warm and burnished, and the strings were richly resonant. This opera has its challenges in presenting an epic story from the destruction of the first temple in Jerusalem to the Assyrian court in Babylon, as the intrigues of the Bablyonian court undermine their own machinations to suppress and destroy the Jews in exile. But even with historic anachronisms and inaccuracies, the story is powered by some of Verdi’s most exquisite music. The uniformly strong ensemble was anchored by Željko Lučić’s moving performance of the title role. He was particularly eloquent in the third-act scena with Abigaille (“Donna, chi sei?”) in which the deposed monarch confronts the usurper, and the stunned Nabucco attempts to assert his supremacy. 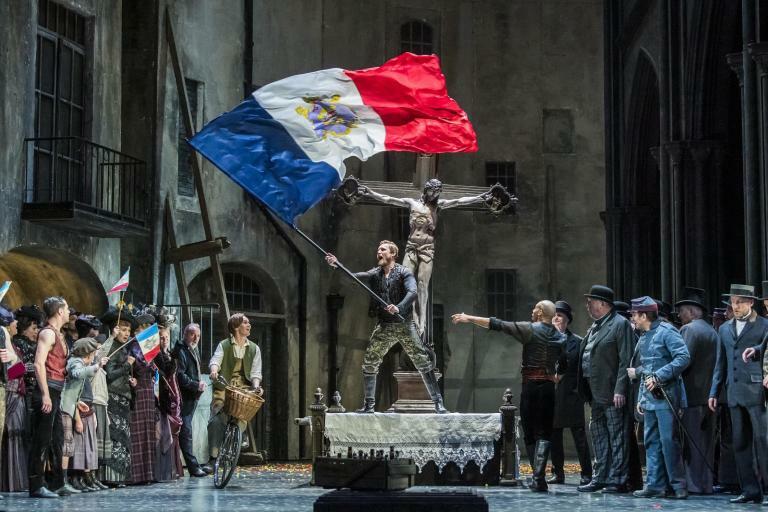 Lučić gave full rein to the emotions in the opera’s concluding “Dio di Giuda.” If he seemed understated in the first act, he was clearly in full control and voice at the conclusion. Tatiana Serjan made an authoritative Abigaille, one of Verdi’s most demanding roles. This young performer addressed the extremes of range, dynamics, articulations, and mood with the vitality the character requires. In the second-act scene, Serjan was astounding in the cavatina “Anch’io dischiuso de giorno,” followed by the cabaletta “Salgo dià dal trono aurato.” This was singing on the edge, her voice reaching the extremes of range with virtuosic accuracy. Sudden low pitches arrived with the same precision as very high ones, to the delight of the audience. As the lovers Fenena and Ismaele, Ryan Center alumni Elizabeth DeShong and Sergey Skorokhodov effectively embodied their roles, especially in the trio “Io t’amavo!” (with Serjan). The clarity of musical lines and the enunciation of text was prominent. DeShong’s final-act aria “O, dischiuso è il firmament!” was a model of Verdian style. Increasing her intensity, DeShong brought out the florid passages to emphasize the aria’s concluding lines. Rizzi’s masterful conducting gave the entire production a distinctive shape, with exemplary cohesiveness. A triumph of Verdi’s early career, Nabucco remains powerful, especially with the outstanding musicianship and stagecraft shown here.